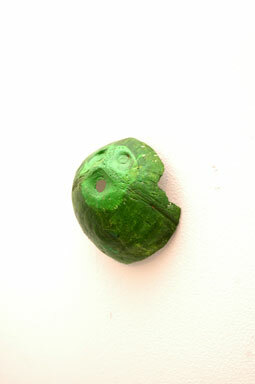 RUN are pleased to present ' Troglodytes troglodytes ', an exhibition of new work by London-based artist Laura Morrison . For her first solo show, Laura Morrison is presenting new works which consider the powerful and seductive techniques of visual language . The works explore both our compulsion to belong, alongside the devices used to bring about that sense of belonging. In the very production of her work she has become both critical of and complicit with the use of these devices. The exhibition is dominated by a large, red acrylic arch mounted onto the wall. The implied illusion that you are at a cavernous opening is self effacing in its use of materials; From the cut-out brush mark bricks each over a foot long, to the raw timber frame, it is merely the sum of its parts. It wants to be a real cave. "Ignoble Polyhedron" is recognizably valuable as a complex, machine-cut diamond shape. The painted surface flaunts itself, tipping its multi-coloured cleavage. In turn, the objects in the show vie for attention. "Blind leading the blind" a pair of invertebrate-like sculptures; distinct by their garb of 'stick of rock', black and white stripes and earthy, muscular solidity, are interdependent in their aspiration to be seen and admired. They want to work in our cave. "Concealed from friends who might disturb Thy quiet with no ill intent, Secure from evil eyes and hands On barbarous plunder bent"
The verse expresses the comforting human appeal of the private worlds common to all the nuances of "Troglodytes troglodytes" . The Troglodyte hoards and collects the artifacts that support his existence and which don't undermine his delicate relationship with the world . Distilling these ideas into this series of works, Morrison gestures to the value and power of "belonging". Laura Morrison graduated in 2006 from Chelsea College of Art, London. Her BA (Hons), completed in 2004 was also from Chelsea College. After being included in Bloomberg New Contemporaries 2006 and Art Futures 2007, Morrison was awarded a place on a residency in Iceland in 2007. Her work has been exhibited at Year 07 in London and Aqua Miami 2007, USA. Her next show which coincides with the exhibition at RUN is the inaugural show of George Polke TWO, London E8, opening at the end of March 2008.